Australia’s finest choc with the world’s favourite liquorice. 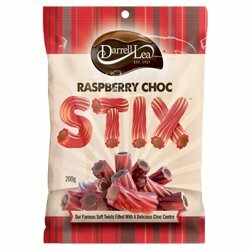 Our STIX range contains 4 great flavours, each with a fun choc-snap in the centre. Each unique variety has been carefully selected and perfected so it is bursting with flavour that will keep you coming back for more! Darrell Lea’s STIX range is the liquorice loved by people of all ages. A raspberry liquorice with a smooth Milk Choc centre! Liquorice (75%) (Sugar, Wheat Flour, Glucose Syrup (Wheat or Corn), Water, Glycerine, Flavour, Rice Bran Oil, Food Acids (E296, E330), Salt, Liquorice Extract, Colour (E129)), Milk Compound (25%) (Sugar, Palm Oil, Whey Powder, Milk Solids, Cocoa Powder, Emulsifier (E492, E322, E476), Flavouring). Food Colour(s) E129 may have an adverse effect on activity and attention in children.